I just got the letter today, it's the first I heard about it. Several times while starting to drive the dash light came on about the door being "open". I opened it and shut it, all was well. I thought it was me not shutting the door with enough force to fully close it? Now I am not sure. Issue is a failure to latch entirely, not related to partial closing of the door. Just got the letter this week as well. I was informed about the recall by my QuickLane service advisor when I took my TI in for an oil change. Guess I'll set-up an appointment in the near future. Here is the letter. The great part is that they do not have enough parts even for the cars in warmer states. It basically says don't bring your car in unless you are having problems...or...we can only fix those cars that have doors swinging in the breeze. I think Ford should have included a roll of twine with the letter to tie the door shut. Last edited by wavsine; 10-12-2016 at 08:29 PM. oops, got a letter, have to see if it's for the 2012 I used to have or for my 2016. Does anyone have the technical service guide? AKA what the technicians actually do and what part is replaced specifically? I know I've seen this before with other recalls. 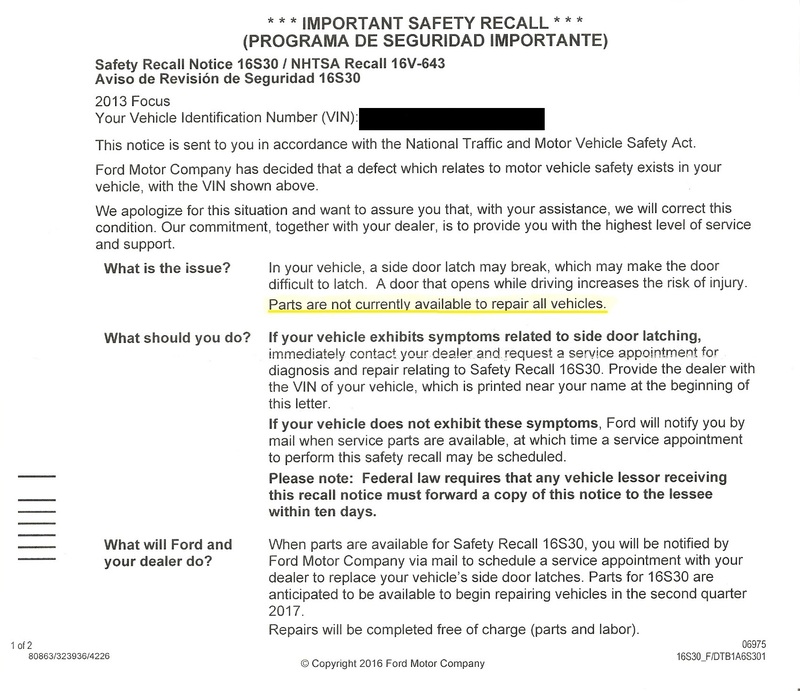 FYI: I have the letter too, bought and currently reside in Minnesota - not just a southern state recall. Got my letter just now. It's for my 2012 that I haven't owned for about 6 months.